I got to two Quilt Shows this weekend. The one was in Oaks, PA and the other one was in Clinton NJ. I even tried to get to a third one, but ran out of time! Both shows were great! But I must say I thoroughly enjoyed the outdoor show in Clinton. The show in Oaks is every year and the one in Clinton is every other year. I highly recommend both! We have received many shipments of fabric! It's like Christmas! http://www.redroosterfabrics.com/content7447.html and download a free pattern using this collection. This line is from Henry Glass called Meet Me in the Meadow. These fabrics are from Red Rooster Fabrics called Pumpkin and Spice. Besides all the muted hues of autumn there is a great panel. 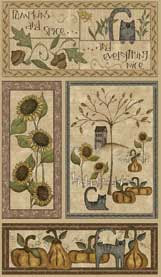 Both the panel and some of the prints feature pumpkins, sunflowers and primitive cats. 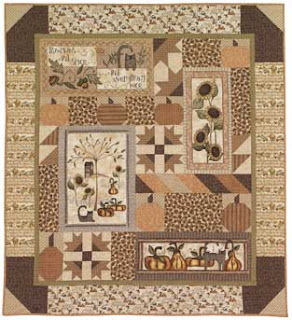 You can download a pattern here for a quilt using this panel and fabric. We are back from Virginia Beach. My husband is a member of the Rajah Shriners and sings with the Chanters. They had a competition in Virginia Beach and took first place. Congratulations Guys! At the banquet following the competition they had prizes that you could win. I bought some tickets and was so hopeful that I would win a wall hanging which was donated by one of the wives of the Shriners. It was so bright and cheerful with very cute flowers on it. I did not win, but I wanted to share a picture of the quilt with you. On Saturday afternoon we got to visit the Cape Henry lighthouses. I really love lighthouses, so this was a real treat for me. On Saturday night we went to Keagans Irish Pub and I saw a neat stained glass pattern, which reminded me of a quilt. After dinner we walked around and I saw some neat works of art outside of the Performing Arts Center. I was working on my blocks for the shop hop and noticed that a number of them were not square. I know that's hard to believe, but it did happen! :-) I remembered reading something at some time about blocking your quilt blocks and I decided to try it. I have a pressing board on my table and I took a piece of muslin and drew a square on it to the size of the square that I needed. I used a Sharpie marker, so that it would not run when I did my blocking. I pinned the muslin to my pressing board. I laid my block on top to see how far it was off. I then starting pinning my block to the lines of the square that I had drawn. I put the pins very close, so that I have a smooth edge when I'm finished. Be sure to use glass head pins that won't melt from the iron. They also need to be rust proof. You will notice that I had a little fullness in the lower left hand corner. It is amazing, but it disappears when I block it. To do the blocking process, I use a spray bottle with water and spritz the block, especially the places with the fullness. I then use a steam iron and go up and down on it. I am holding the weight of the iron. Do not iron the block, just the up and down movement. Then I let the block thoroughly dry. When it is dry, this is how it looks still pinned fast to my board. See, the fullness is gone! Voila! The finished block, ready to be sewn into my quilt. I remember reading that you can also block a quilt that has been quilted, by pinning it into a carpet and using a steam iron over it and then letting it dry. I have not tried this yet, but you never know! I bought a chance to win this one. I sure hope I'm lucky! Just look at the detail in this one! If you look close, you will see an egret standing in the grassy marsh. We saw so many wonderful things as we walked the Salt marsh trail. Joann stopped by and had a show & tell. It is a beautiful quilt of stars with flowers appliqued in the centers. I just love it! Great job! 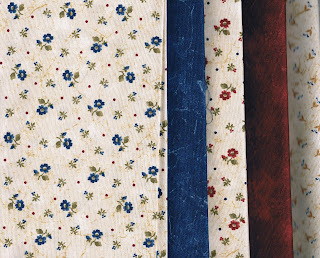 We just got in Maid of Honor fabric from Maywood Studios. It is a beautiful line in reds and blues. 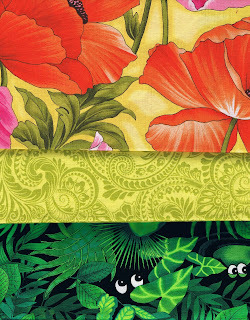 We also got a great lime green paisley and large poppies on a yellow background. If your looking for frogs, we have the cutest print with luscious green leaves and frogs eyes peering out from the dark.